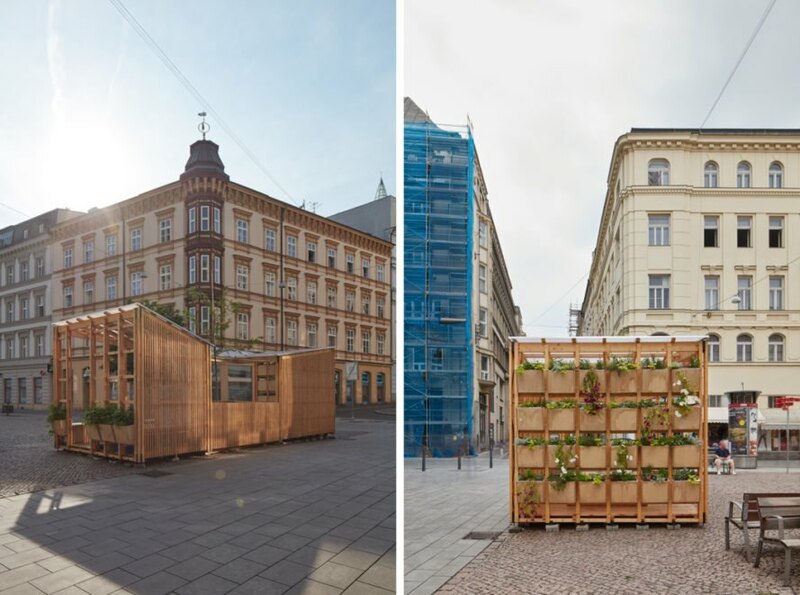 Galvanized by the growing debate on climate change, Brno-based KOGAA Architectural Studio and NEXT Institute Research Platform have teamed up to create the City Cell Prototype (CCP), a pop-up installation that serves as a testing ground for ways cities can combat climate extremes. 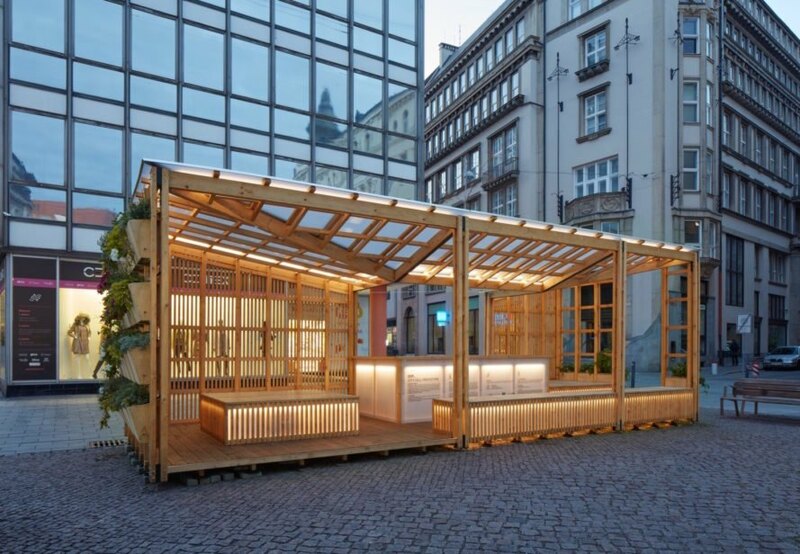 Completed this year, the temporary pavilion of nearly 300 square feet is presently located at Malinovsky Square in Brno, Czech Republic’s second-largest city. 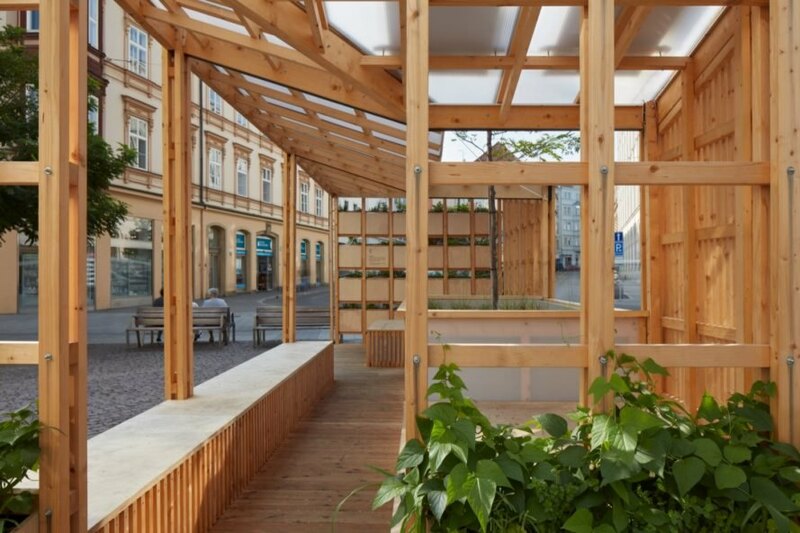 Built of timber and powered by solar energy, the City Cell Prototype is a multifunctional design that includes rainwater reuse, urban greenery, human shelter and educational opportunities. 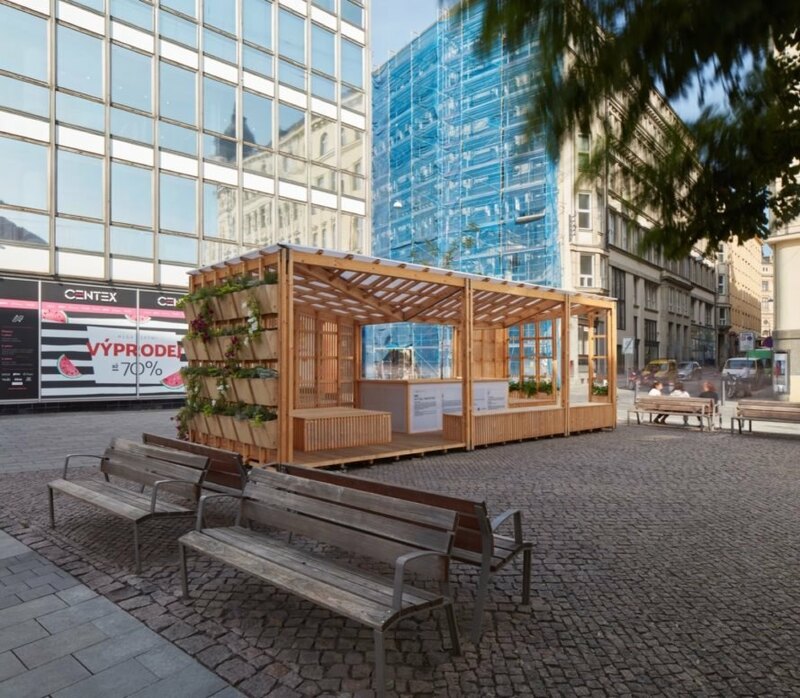 The City Cell Prototype is primarily constructed from pre-dried KVH timber, a material that has the added benefit of not requiring any additional protective coatings. Elevated off the ground on footings, the wooden structure is centered on a tree set inside a “biofilter.” To make the pavilion look inviting to the public, KOGAA inserted low-slung seating and made the all-timber envelope as transparent as possible using slatted wood screens and two entrances. In addition to the tree, planters have been installed on both ends of the structure, with one wall comprising rows of street-facing planters. Despite the pavilion’s minimalist appearance, the structure features multiple systems that work together to ensure energy self-sufficiency. The sloped roofs, which are made from a translucent material to let light through, are angled to channel rainwater into the centrally located biofilter, where the runoff is then filtered through settling and phyto-processes. Once filtered, the rainwater is stored in tanks and then pumped up to a drip irrigation system connected to the pavilion’s planters. The water pump is powered by solar energy harvested from photovoltaic panels mounted to the roof; solar power also provides electricity for the LED lighting system. “Together with the vertical greenery, the biofilter allows water retention and evaporation, allowing the surrounding microclimate to cool down,” the architects explained. “Its shape develops from the need to provide shading, collect water and the intent to create a spatial communication between the new object and the existing square, also achieved through the two-sided openness.” After the testing period, the CCP could be included in more permanent projects. 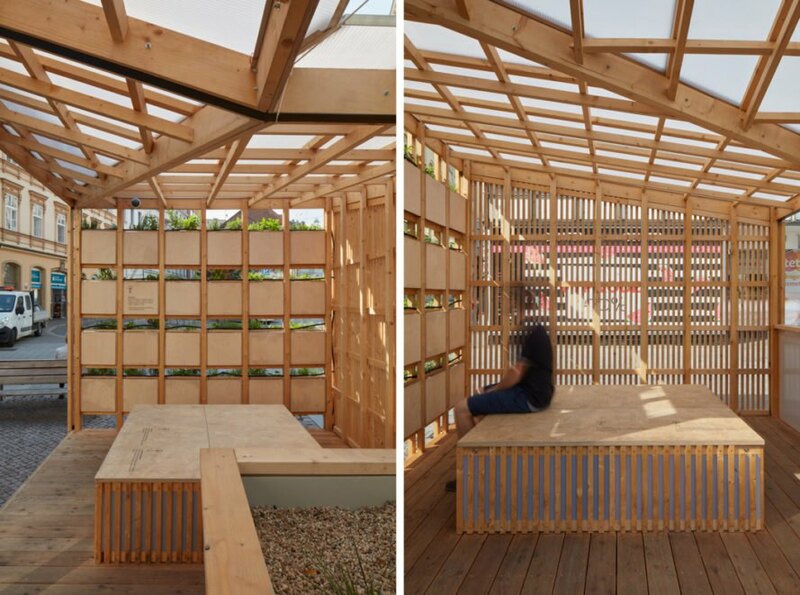 This seemingly simple pavilion integrates smart technology for self-sufficiency. 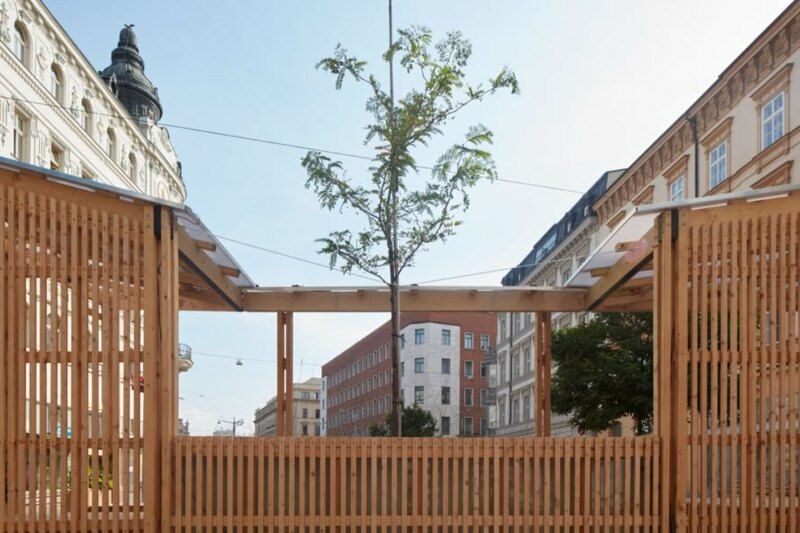 The pavilion, designed in collaboration by KOGAA and NEXT Institute Research Platform, is a response to the growing threats from climate change. The City Cell Prototype is nearly 300 square feet and features solar power, rainwater reuse and more. Urban greenery grows on the outside and inside of the cell. The designers made the space open and transparent to welcome curious onlookers. Simple benches allow people to rest while they learn more about climate change and smart responses to this issue. Solar panels on the roof power a water pump and the LED lighting. The pavilion offers shelter and educational opportunities. An innovative biofilter keeps the central tree healthy and growing.